Illustration of a single cellulose nanocrystal. Image: Robert Sinko. Cellulose nanocrystals derived from wood are capturing researchers' attention for their extreme strength, toughness and elasticity. The materials are so strong and tough, in fact, that they could possibly replace Kevlar in ballistic vests and combat helmets for the military. Unlike their source material, cellulose nanocrystals are also transparent, making them exciting candidates for protective eyewear, windows or visual displays. Although there is a lot of excitement around the idea of nanocellulose-based materials, the reality often falls flat. "It's difficult to make these theoretical properties materialize in experiments," said Sinan Keten, an assistant professor of mechanical, civil and environmental engineering at Northwestern University's McCormick School of Engineering. "Researchers will make composite materials with nanocellulose and find that they fall short of theory." Keten is leading a team that is now adopting a materials-by-design approach toward developing nanocomposites with cellulose. They have developed a novel, multi-scale computational framework that explains why these experiments do not produce the ideal material and proposes solutions for fixing these shortcomings. These solutions involve modifying the surface chemistry of cellulose nanocrystals to achieve greater hydrogen bonding with the polymers in composite materials. Supported by the US Army Research Office and the US National Institute of Standards and Technology, the research appears in Nano Letters. Xin Qin and Wenjie Xia, graduate students in Keten's lab, are co-first authors of the paper. Robert Sinko, another graduate in Keten's lab, also contributed to the study. Found within the cellular walls of wood, cellulose nanocrystals are an ideal candidate for polymer nanocomposites, in which nanoscale filler particles are embedded in a synthetic polymer matrix. Nanocomposites are commonly made from synthetic fillers, such as silica, clay or carbon black, and are used in a myriad of applications ranging from tires to biomaterials. "Cellulose nanocrystals are an attractive alternative because they are naturally bioavailable, renewable, nontoxic and relatively inexpensive," Keten said. "And they can be easily extracted from wood pulp by-products from the paper industry." Problems arise, however, when researchers try to combine the nanocellulose filler particles with the polymer matrix. The field has lacked an understanding of how the amount of filler affects the composite's overall properties, as well as the nature of the nanoscale interactions between the matrix and the filler. Keten's solution improves this understanding by focusing on the length scales of the materials rather than the nature of the materials themselves. 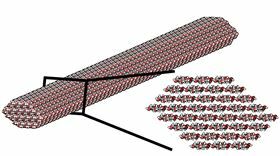 By understanding what factors influence properties on the atomic scale, his computational approach can predict the nanocomposite's properties as it scales up in size, with minimal need for experimentation. "Rather than just producing a material and then testing it to see what its properties are, we instead strategically tune design parameters in order to develop materials with a targeted property in mind," Sinko said. "When you are equalizing music, you can turn knobs to adjust the bass, treble etc to produce a desired sound. In materials-by-design, we similarly can 'turn the knobs' of specific parameters to adjust the resulting properties."